We are mothers, partners, bosses, employees, colleagues, daughters, sisters, best friends, clients, mentors, and caretakers to everyone. And as a result, we can get caught up in the endless demands heaped upon us day after day. When you focus on being all things to everyone you start to lose who you are, leading to stress, resentment, feelings of being overwhelmed, and finally, the inevitable burnout. To our detriment, we find ourselves capable of dancing on this edge of burnout for a very long time. I can’t even tell you how long I spent just plowing through my days doing more, more, more. I know there are times that I very much still get caught up in this pattern, and by putting practices in place I am able to get back on track so much faster. Here are some practices I’ve found most helpful to prevent this from happening. When morning rolls around take care of your own needs first. When you wake up (raring to go or not) it’s tempting to just get right into the action, but don’t. How your day begins sets the tone for how your day will progress, so establish a routine that looks after the well-being of your mind, body and spirit. Waking up just 15 minutes earlier will make a bigger impact on your life than you can ever imagine. This is radical thinking, I know, but find a real alarm and leave your technology (including the television) out of the bedroom. You will fall asleep easier, sleep deeper, and even find getting up in the mornings easier, too. Once you’re up you’ll slip into your morning routine without the temptation of your phone beckoning to you. When was the last time you finished a cup of coffee while it was still hot? Did you eat lunch, or even have a break? It’s one thing to slip into your flow and move through your day, but your mind and body need a rest. Working in 45 minute blocks with 5-15 minute breaks is widely accepted as the most beneficial and effective way to schedule breaks throughout the day. Use this time to stretch, walk, read, power nap, write, enjoy a healthy snack, meditate, or listen to music—the choice is yours. Stress will affect your breathing, during our most tense moments our breath tends to get very shallow. Proper breathing contributes greatly to our overall well-being. The best breathing comes from deep within our belly. Count to 3 while you breathe deeply into your belly, then count to 3 while you gently exhale. Do this 5 times throughout the day. It doesn’t matter whether it’s yoga or dancing, walking or cycling, if it makes your body feel good then you should be embracing it! It will help you relieve tension and improve your mood. Any type of exercise will give you an endorphin boost and leave you feeling better, so even just 10 minutes of activity will be enough to improve your mood. In truth, it is all about respecting your time and priorities because if you don’t, no one else will. Practice setting boundaries in all areas of your life and be firm as you stick to them. Dancing on the edge of burnout is not a desired lifestyle and is totally preventable, yet it takes a well-planned and deliberate effort. Avoiding burnout starts by putting some of these preventative measures in place. Getting support and setting clear action steps will help you implement these simple practices with greater ease. 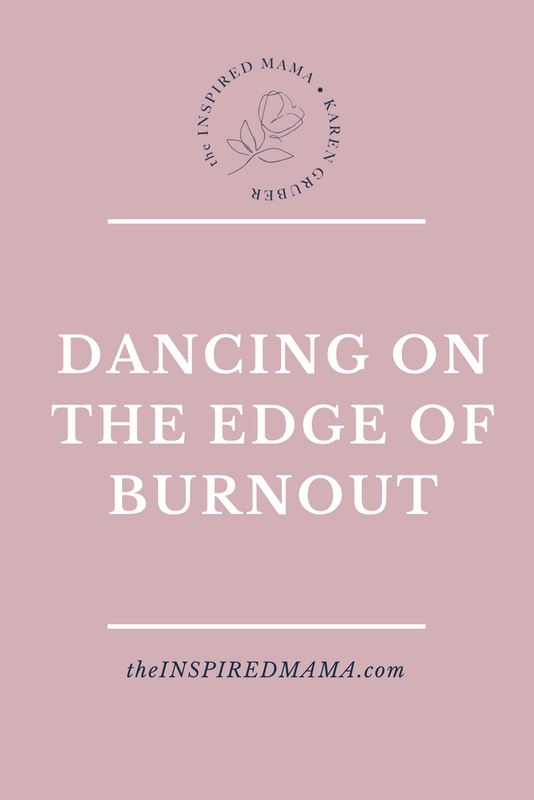 Worried you are dancing on the edge of burnout and would like some support? Click anywhere in this box to schedule your FREE 30-minute Spotlight Discovery Session.